Stylish, design-led and robust healthcare furniture has been supplied by Bradford-based Knightsbridge Furniture to complete the £42m Kingfisher Court mental health unit in Radlett, Hertfordshire. ‘The facilities at Kingfisher Court are truly world-class and we’re very proud to have delivered our furniture to such a prestigious project,’ says Knightsbridge MD Alan Towns. Kingfisher Court is part of a £100m five-year ‘Transformation Programme’ through which Hertfordshire Partnership University NHS Foundation Trust (HPFT) is radically redeveloping its mental health provision across Hertfordshire, North Essex and Norfolk. 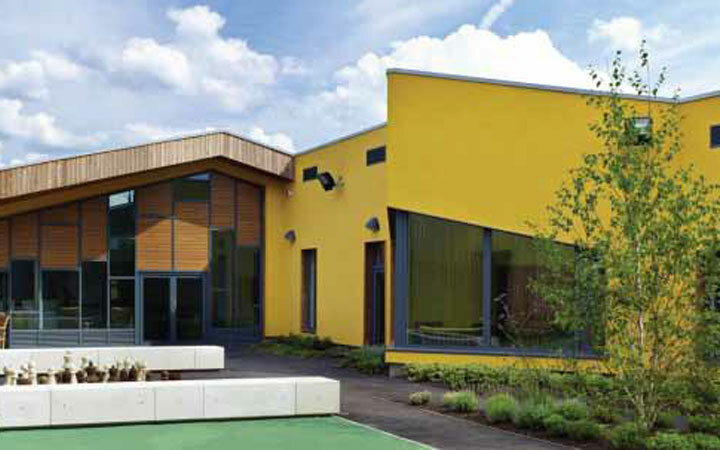 Under main contractor Medicinq Osbourne, the new 86-bed adult acute inpatient facility has been built on the site of the former Harperbury Hospital, blending into the surrounding woodland through its use of natural contours and materials both inside and out. The light and airy Kingfisher Court day rooms have been populated with Hula circular dining tables from Knightsbridge Furniture’s specialist Challenging Behaviour Collection, which combine contemporary styling with inherent strength and stability. The tables are complemented by the company’s elegant Harvey upright armchairs: all exposed wood has the same Walnut finish and the chairs are upholstered in waterproof Aston faux hide. Knightsbridge Furniture holds Preferred Supplier status with the NHS, the SHS, HSE Ireland and key providers of private and charitable healthcare. The company’s Challenging Behaviour Collection is crafted at the company’s plant in Yorkshire using timber from renewable sources. Knightsbridge Furniture also displays its commitment to sustainability through PEFC and FISP certification, ISO 14001:2004 accreditation for its environmental management system and BS EN ISO 9001:2008 quality management accreditation.